This is the hopefully the last of the blogs that I had "saved up" on the "hard drive" I call my brain. Sometimes it acts a lot more like a "floppy disc" (remember those? God, if you start talking about "ancient" computer technology, you really are getting old! )...I wish I had written this one when all of these memories were still really fresh. But I am not that worried. The trip that Amy and I made to the Birla Mandir temple in Hyderabad, (one of the most beautiful places I have ever seen in this world!) had more than a few memorable moments! "An enchanting temple dedicated to Lord Venkateswara, the Birla Mandir of Hyderabad, India stands in its entire splendor on the hilltop of Kala Pahad. Made of over 2,000-tons (!!!) 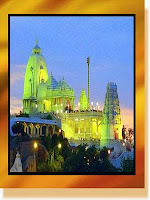 of pure white marble from Rajasthan, the Birla Mandir overlooks the serene and placid waters of the Hussain Sagar Lake. The famous Birla industrialist who had built a large number of temples all over India built the Birla temple of Hyderabad. They finished building the Birla Mandir of Hyderabad within a time span of ten years. The magnificent shrine offers a wonderfully breath-taking view of the twin cities of Hyderabad and Secunderabad. As you enter the temple you can see the 'Gopuram' or the pyramid shaped temple top, which is a characteristic feature of South Indian temples. The tower situated at the top of the principal deity called the Jagadananda vimanam is again built in the Orissan style. The flagstaff of the temple is made up of brass, and reaches to a staggering height of 42 feet. The granite stone, out of which the idol of Lord Venkateswara has been carved, is about 11 feet tall. A Lotus shaped canopy at the top of the idol is again done in marble and looks stunning. Along the winding path that leads to the main worship place, are many marble statues of Gods and Goddesses of Hindu mythology that look almost real. In case you visit the temple in the early hours of the day, you can hear some very melodious South Indian music in the praise of the Lord. The Birla Mandir of Hyderabad becomes a spectacular sight in the evening when it is illuminated with hundreds of bright lights." The Birla Mandir Temple is one of those Seven Wonders of Hyderabad that I knew was going to be near the top of our list of "things to see first". (BTW...that website has some pretty cool 360-degree panoramic photos of some of the more notable sights that are just great!). 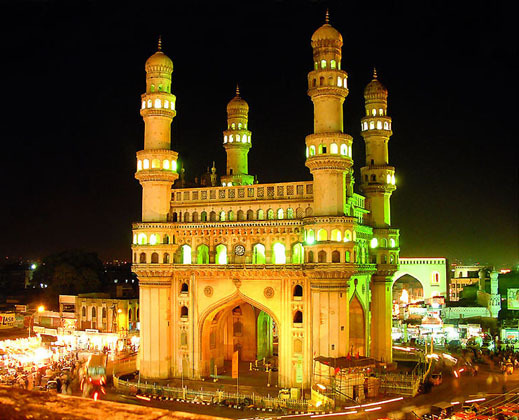 We've already seen Charminar (it was near where we registered for our Foreign Residents Certificate! ), the Hussein Sagar Lake with the giant Buddha statue in the middle, Hi-Tech City, of course, (it's where Amy works!) and Silparamam (kind of a big convention center in a traditional Indian architectural style) - which we pass often on the way in to Deloitte's campus. Today I will get my first up-close look at the Golconda Fort - our driver Krishna and I are going to go looking for the St. Gregorios Orthodox Cathedral near there...I need to find out when Great Liturgy is tomorrow...there is no Cathedral website and the Priests have not been answering their mobile phones! I was the one who planned our outing to Birla Mandir. In case you have not noticed by reading this blog regularly, I am far and away the person in our marriage most-likely to "step outside of the box" and try new things...especially if the new things are of a spiritual nature. Amy Suzanne...well... not so much. It's why the yin-and-yang of our relationship works so well. She keeps me from jumping off the high-dive into the deep-end...while I am the one that assures her that the waters in the wading-pool are "just right"! With that imagery still in mind, let's just say that for my Amy...our trip to the Birla Temple was like a cliff-dive in Acapulco! Naseer (our old driver) was quite familiar with the roads to Birla Mandir. It's a good thing, too...because, although you can see the beautiful white-marble landmark from virtually anywhere around the Hussein Sagar lake area, the way up to the top of the hill it sits on is a winding series of very narrow roads...and the roads near the top are used by pilgrims visiting the Temple as a parking area. There were some seriously tight squeezes on the way up. Naseer dropped us off in the parking area near the temple. This is when I saw the first panicked look on Suzanne's face. Despite popular belief, my loving wife does not suffer from agoraphobia. Let's just say that she prefers to stay inside. The house. In the bedroom. In our bed. With the lights low and the DVD player playing a favorite movie or TV show. Stepping out of the house into THIS scene almost popped her circuit breakers! There were literally thousands of visitors to the Temple that day. You see, the temple is only open in the morning for pooja (that's early morning "praise and worship" for you Evangelicals out there!) - then it closes all day...then it re-opens at around 4:00 P.M. and stays open well-past-dark. Our plan was to arrive at around 5:30 P.M. - and be there for when the lights are put on - white and colored lights which nightly turn the Temple hill into a kaleidoscope of softly-glowing colors on the white marble. We had seen pictures, but - we wanted to make our visit "just right". What they don't tell you is that the 5:30-6:30 hour is the line-up and the crush of pilgrims wanting to make their evening darshan at the uppermost part of the Temple...as that is where 11-foot-tall granite statue of Lord Venkateswara makes his home. Our first stop on our journey to the top of the hill was the mad-crush of people going into the "Shoe Depository". Amy shot me a look of pure panic when I said to her that "this was the place where we had to take off our shoes and leave them with the "authorities" - -and that all would be well because "they would give us a ticket with a number so we could get them back when our temple visit was over." Also, as it turned out, there are no photos, no videos allowed once you get past security (which is pretty tight!) and inside the Temple grounds...so I (along with a couple-thousand other folks in the same situation!) had to do something similar with my Blackberry. As we removed our shoes (and my socks...I am beginning to see why sandals are so popular here! )....Amy again looked shell-shocked. You have to remember...this is a woman who bails on a full shopping-cart filled with clothes at the Pasadena Ross Dress-for-Less when the check-out lines are too filled with people! Agoraphobia alert!! I hustled her outside and took care of the "shoe and cell-phone" drop while she stood outside looking pale. Speaking of "looking pale" - - on the day we went, we were the only foreigners (of any kind!) floating in a sea of thousands of Indian faces. You never quite get used to getting stared-at here. It feels like you are on-display at the zoo! Amy gets it far more often and far worse than I do because she is so fair and so blonde. Now, it's kinda cute when the little kids stare at you...we know that we look different to them! But with the adults, it gets kind of annoying! And they are not shy about staring, either. You really want to use the old line: "Hey, buddy, take a picture, it'll last longer!" We made it through the crush of the security queue (the lines here are very similar to the traffic...if you do not keep up, you will be passed on the shoulder and cut off!) - and began the climb up the first of about 1,000 stairs. It was hot and steamy that afternoon, and it didn't take long for me to begin to sweat profusely going up the marble steps. At the top of the first set of steps, you arrive at the first "chapel" (that's what I'll call it...I'm sure there is a proper Hindu term for it!) - dedicated to the elephant-headed god of prosperity, Ganesha. From the various vendors-stands on the road up to the temple site, many people had purchased coconuts and flowers and sugar-cane (Ganesha is quite fond of sweets, you know!) to make an offering at this particular shrine. Our driver Krishna told me once that there are certain days when pooja is to be properly made to certain gods. Sunday for Lakshimi or Durga, Friday for Shiva, Saturday morning for Vishnu, Radha-Krishna and Tulasi (it's Saturday morning as I write this...and in ten-minutes, I have been invited to help with the Tulasi Devi pooja!) I asked Krishna "When is the proper day for offering "pooja" to Ganesha?" He answered with a smile: "Ganesha pooja...any day, sir!" So, as you approach the entrance to the Ganesha shrine, there is a white marble "booth" where a Hindu Priest is sitting, wearing a clean white loin-cloth and a garland of red and yellow flowers around his neck. He has a red tilak dot in the middle of his forehead. And he, too, is sweating. Why? For a couple of rupee coins, he takes your coconut (the one you brought!) and smashes it with a hammer so that it breaks in equal halves. He puts a small handful of flowers into the coconut halves and they sort of mix with the coconut milk inside. This flower/coconut milk concoction is then taken and poured upon the head of the Ganesha stature in the center of the shine that bears his name. You stand in a line of Ganesha devotees (everyone here is, in one form or another...Ganesha is beautiful and never ceases to bring a smile to my face!) and they pour the mixture over his head, stop and say a prayer. Then, the people take a small pinch of the tilak powder and offer it to Ganesha...and then, with their finger, place a small red mark on their foreheads and the foreheads of their small children. Old and young alike leave the shrine with a sign of Ganesha's blessing visible to the world. More to shock Amy than anything else, as she turned away to leave the "chapel" - I took a small amount of the red tilaka and put a way-too-large red dot on my own forehead. My Christian friends, worry not...I was not "offering a pinch of incense at the shrine of Caesar"...it was more like "when in Rome..." Getting her to turn around, I said, "Hey, Max..." (one of several pet names for Amy) and she turned around and saw my dime-sized red tilaka. She just squinted her eyes, turned to walk-on as she shook her head. Like she always says, "Life is never boring with you, Sweetie!" Leaving Sai Baba's shrine (like I said, this place is HUGE!) - we walked out onto a large marble courtyard. I'll call it the courtyard of "All Paths" - - all of the great religions (Christianity, Islam, Buddhism, Confucianism, etc.) were depicted in bas-relief marble panels. The Christian shrine showed Jesus preaching the Sermon on the Mount...and the words to the Beatitudes were carved along side His form. After marveling at seeing and reading the words of Our Lord here in this sacred Hindu place, I was overwhelmed with gratitude and peace. "The Peace that passes all understanding." - that, I believe, was what St. Paul was fond of calling it. On this large marble veranda, there was also a sturdy marble rail that Amy and I leaned on to look at the incredible view. From this vantage point you could see all the way to the other of the Twin Cities - Segunderabad. There was also the most wonderful breeze that came up. Good thing, too...my shirt was soaked-through and my red tilak mark was melting and running down my nose! We continued upwards and climbed what looked like the final staircase. As we neared the top, I could see that if we actually passed the top step, we would be swept-up and merged into a huge but slow-moving line of Hindu pilgrims...all waiting to get into the biggest of the shrines....the main "sanctuary" if you will. I was later to find out that they were all waiting to get in for evening darshan to the huge granite statue of Lord Venkateswara - the chief god of this particular mandir. Again seeing "that look" on Suzanne's glistening face, I knew that she had reached her limit...and so had I. There was no way I was standing in that line. We came back down the stairs we had just climbed, feeling a bit like a salmon swimming upstream...when a man stopped me and asked if I was sure I did not want to go to darshan. I assured him that it was O.K. and we needed to leave. He looked at my messy red tilak, melting in the sweat, then sort of looked me up and down, and I think right then he realized that I was not a real devotee of Ganesha! Good guess, my friend! "My good man, I would not stand in this heat and in that big of a line, if it were the Pope himself sitting inside of that shrine, giving out free samples of Relics of the True Cross!!" But I held my tongue (I think it may have been sweating as well!) and just smiled at him as we passed. Soon we had descended all of the stairs, and arrived back at the ground-level and the "Shoe Depository". With about 500+ other pilgrims who were either arriving or trying to leave the temple grounds. This time, Suzanne had me go inside alone to collect our belongings, while she waited outside. With Blackberry in hand, and shoes back on our now-dirty feet, there was one final thing of note that happend that particular afternoon. And it is actually how this article got its title. As we were collecting our thoughts after a strange but amazing day, and even though my loving wife was melting before my eyes...I really wanted to go into the large gift-shop on the grounds, over near the parking lot. We each bought a large ice-cold bottle of water for Rs. 160.00 and went in. The shop was cavernous, it was packed with people like every other place we had been - and it was still steamy-hot, despite mercifully being out of the sun. I must say, Amy was a real trooper, and followed me around as I looked at the spiritual wares inside. They had statues of all of the gods...beautiful brass ones of every size. Ganesha, Shiva, Lakshimi...but I could tell from the prices that this was not the place to purchase items such as these. It seemed sort-of like going to Disneyland to buy a stuffed Pooh Bear...when you can get the same one at Target for 1/10th of the price. But it was still fascinating to see all of the different idols and icons under one roof! On the back wall at the far end of the shop, they had hung these day-glow colored, shiny Ganesha icons that were actually 3-D "light-boxes". They had to be at least 3-feet by 2-feet....glowing and reflecting the glow of all sorts of colored lights wired inside...with brightly colored foil inside each the boxes. They were as gaudy as they were beautiful and interesting. "Wow..." I said, looking at one particularly amazing lighted piece featuring a cross-legged, pot-bellied Ganesha with five heads!! "Amy!! Look at this one, Sweetie!" I think she was picturing this glowing five-headed multi-color and foil-reflecting Ganesha light-box hanging over our mantle piece backe at home on Old Mill Road! I looked shocked and hurt at first...but - I soon realized that she was correct. I DO have a bit of a history when it comes to purchasing such crazy things for the house. "Sweetie, you know that it's best to nip these things in the bud before they take on a life of their own!!" Wow! She really does know me, doesn't she?? Thanks, Ravi...it's now a great time to go there...the Birla Mandir in Jaipur is noce, too...but the Hyderabad one is much bigger!